Now most guitars today are ‘stage ready’ electro acoustics and come with some form of pickup in them already. But if like me you are not happy with the sound what can you do? Today we are going to compare the inbuilt piezo tranducer pickup with a Fishman Rare Earth Single Coil soundhole pickup and both of these against the natural sound of the guitar through mics. In theory Mic’s are probably the best way to amplify the sound of your acoustic, but it is very difficult to achieve that perfect sound. You can get feedback and muddiness and if you move you move away from the sweet spot of the guitar. 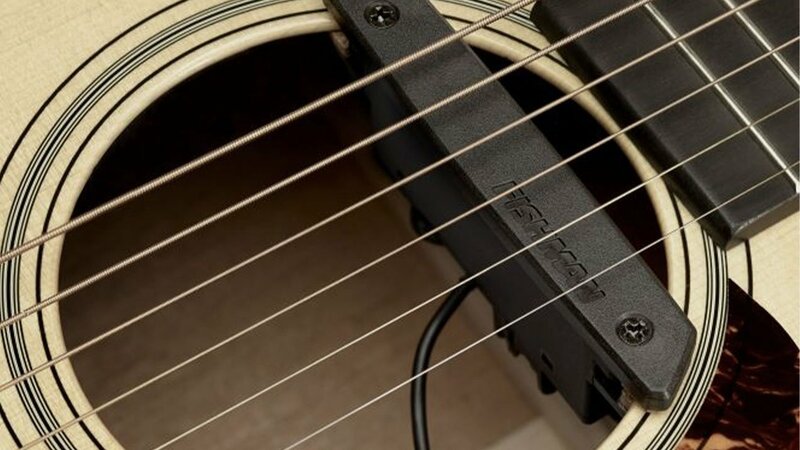 Most electro acoustics have one of these already installed. They sense the immediate vibration of the strings through the saddle. Typically made of strips of tiny piezo crystals that sense vibrations and transform them into an electrical signal. Pros: resistance to feedback; invisible installation; natural sound. Awesome for fingerstyle or moderate strumming. Cons: If you have a strong attack and you play with a heavy pick, this type of pickup can produce a “quacking” sound, which can be very annoying. Rarely sound good. They need a pre-amp in the guitar. The Fishman Rare Earth Single Coil has been carefully re-voiced and fine-tuned to offer a smooth acoustic tone, which is warm and natural.